After a holy childhood, Colette joined a society of devout women called the Beguines. Not finding their state sufficiently austere, she entered the Third Order of Saint Francis, and lived in a hut near her parish church of Corbie in Picardy. 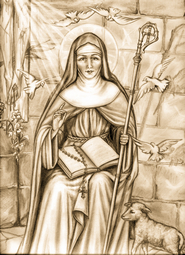 Here she had passed four years in extraordinary penance when Saint Francis, in a vision, bade her undertake the reform of her Order, then much relaxed. She doubted for a time and was struck with muteness for three days and blindness for another three. Finally, fortified by ecclesiastical authority, she established the reform throughout a large part of Europe, and, in spite of the most violent opposition, founded seventeen convents of the strict observance. By the same wonderful prudence she helped to heal the great schism which then afflicted the Church. The Fathers in council at Constance were in doubt as to how to deal with the three claimants to the tiara  John XXIII, Benedict XIII, and Gregory XII. At this crisis Colette, together with Saint Vincent Ferrer, wrote to the Fathers to depose Benedict XIII, who alone refused his consent to a new election. This was done, and Martin V was elected, to the great good of the Church. Colette also assisted the Council of Basle by her advice and prayers, and when God revealed to her the spirit of revolt which was rising there, she warned the bishops and legates to retire from the council. Saint Colette never ceased to pray for the Church, while the devils, for their part, never ceased to assault her. They swarmed round her in the form of hideous insects, buzzing and stinging her tender skin. They brought into her cell the decaying corpses of public criminals, and assuming monstrous forms themselves, struck her savage blows. Or they would appear in the most seductive guise, and tempt her by many deceits to sin. Saint Colette once complained to Our Lord that the demons prevented her from praying. Cease, then, said the devil to her, your prayers to the great Master of the Church, and we will cease to torment you; for you torment us more by your prayers than we do you. Yet the virgin of Christ triumphed alike over their threats and their allurements, and said she would count the day during which she suffered nothing for her God, the unhappiest of her life. She died March 6, 1447, in a transport of intercession for sinners and the Church. Reflection. One of the greatest tests of being a good Catholic is zeal for the Church and devotion to Christ's Vicar.